TerraWise is building a new custom floor plan that has been in the works for a spec home opportunity in Historic Springfield on one of the few wider lots in the neighborhood. This will not likely be part of our ongoing Springfield home offerings since there are few lots in the neighborhood with enough width needed for the wrap-around porch. If you drive through Springfield there are some of the historic older homes with wrap-around porches. Not many though since the majority of lots are too narrow. Our lot at 1454 Pearl Street is one that does work. It won't be on the market or available for purchase until the home is at least into drywall stage (anticipated Spring 2019.) That will still leave a buyer time to add custom finishes and other selections. The porch of course is the focal point and drives the front elevation (architectural design) along with the lower and upper bay windows. This floor plan works well with those exterior features. The first floor living area is surrounded by the porch with a very open feel to the dining room and kitchen (not what you would likely find in most of the older homes like this.) There is also a bedroom and full bathroom. 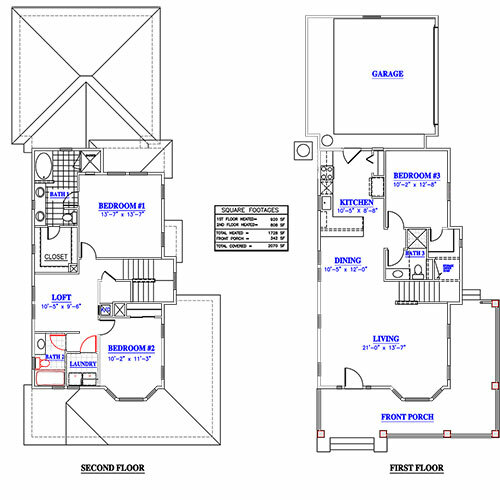 The second floor has a nice loft, another bedroom with an adjacent full bath and a large master bedroom/bath, which would be similar to the historical floor plans. There is room so a garage is also included. Share your thoughts with a comment below or contact our Springfield agent Jac Shacter. Stay tuned to the blog for more on this exciting custom home.